There’s a lot of stuff in the news right now about the testing of Arizona’s 2010 law in the Supreme Court which allows state police to stop and detain undocumented people, like maybe you or me, out for a jog without our driver’s license, simply on the basis of “suspicion.” Several states have recently passed similar laws including Alabama which has been struggling with both embarrassing uses of the law, like several automotive executives being detained, and the loss of revenue by local farmers who didn’t have pickers when they needed them. Over the past two years, right leaning, dare I say Republican state legislatures, have seized power and the opportunity to press these and other “social engineering” laws into action. However, the unintended impact is coming home to roost in many cases with the loss of local revenue, and needed workers for low skilled jobs. Recently one can observe a split in the Republican Party between pragmatic business interests that are looking to find compromises and “Tea Party Republicans” that want to purify our nation. Beyond the troubling aspect of harkening back to the Nazi era of “your papers please” and questioning how this fits into the American concept of liberty, there is a more fundamental observation that one can make that renders this issue and the pending Supreme Court decision irrelevant. I recently attended the Babson Latin Entrepreneurship Forum and learned some really interesting stuff, much of it from a presentation by Carlos Guzman, CEO of ProMexico. I hope that he will forgive me for using some of his charts. NAFTA was enacted back in 1994. At the time, there was fear that this would lead to an exodus of American jobs into Mexico and in fact, in many cases this was true. But it was also true that more American jobs were being outsourced to China at the same time. Now we have the opportunity to look back and see what happened. As of 2010 NAFTA accounted for almost one trillion dollars of trade between the US, Canada and Mexico, doubling since 1993. Mexico is the US’s third largest trading partner, after Canada and China, adding up to around half a trillion dollars per year. The true effect of NAFTA wasn’t so much the export of US jobs but rather it caused the export of European and Asian jobs into Mexico in a much bigger way. Mexico’s economy is booming, currently number 11 in GDP, larger than South Korea. 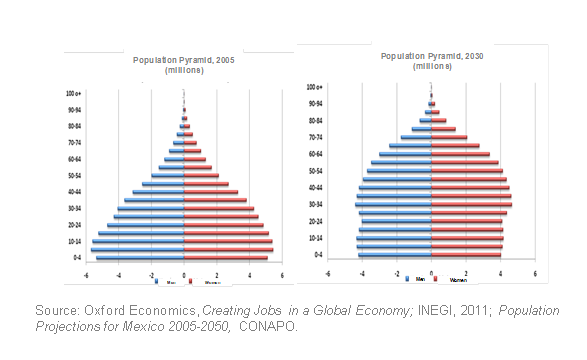 Goldman Sachs forecasts that Mexico will grow to be the fifth largest economy by 2050. This isn’t apparent when you read the newspapers regarding the latest in drug related killing, but quietly and efficiently over the past 10 years, Mexico has been transformed from a sleepy economy that exported for the most part oil and food to one that is moving soon to become one of the world’s largest economies. 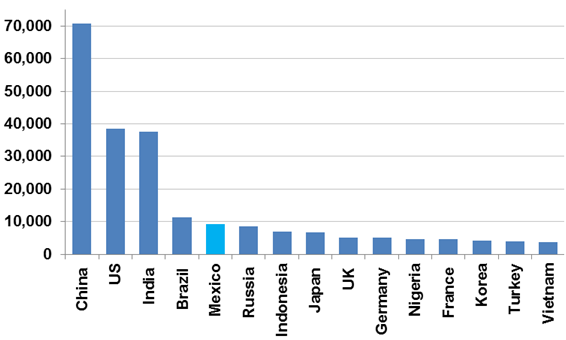 It’s already the third largest trading partner of the US, just behind Canada and China. It’s remarkable to observe as shown above, that Mexican exports have climbed to $350B and are comprised of less than 10% oil and food products and 90% from the manufacturing sector of electronics and automobiles of virtually every brand. NAFTA has attracted every major auto manufacturer from Asia and Europe to Mexico where labor prices are reasonably low, there is an enormous pool of available workers, there are lower shipping costs into the US and Canadian markets, and there is free trade into the US and Canada. To make this better for Mexico, the age distribution in the country is shifting a baby boom bulge that is maturing into a growing workforce adding roughly 17 million workers by 2030 while reducing the size of the age group that is most commonly associated with crime (according to US statistics). Therefore the entire concept of building a $6B wall between the US and Mexico was ill conceived in the first place. The real goal should have always been (and was attempted with NAFTA) the growth and stabilization of the Mexican economy. If Mexico was as prosperous and safe as Canada, for example, nobody would want to leave. In fact, the Pew Hispanic Center suggests that immigration from Mexico has “began to slow five years ago and may have reversed in the past two years.” The $6B would have been better invested in the direct goal of helping to socialize the youth of Mexico along with continuing their economic growth. Now even Mexicans will readily admit that the drug problem and its resulting crime problem is serious and they are trying hard to attack it, literally, with federal forces, in much the same way that J. Edgar attacked the organized crime waves in the US back in the 1920s that were rooted in prohibition. However, similar to the US, the real problem with drugs for Mexico is on the demand side (as was true for American consumption of alcohol) and not on the supply side. Note that Mexico was not historically a source of drugs but rather was on the delivery route from suppliers in South America, and Mexico got snared in the mess, building both crime syndicates and users. The real route to solving the drug crime problem is a combination of what Mexico is trying to do in enforcement, along with the reduction in demand through the decriminalization of at least marijuana in the US. Marijuana that is imported from Mexico represents 60% of the total drug trade or around $100B. So, in the end, it doesn’t really matter whether our uber-conservative leaning Supreme Court upholds the recent trend in anti immigrant state legislation. Nor does it really matter whether we finish the wall, and keep it maintained. It is likely to become a tourist attraction soon and we would be smart to think about naming it. My favorite would be the “Great Wall of North America” or “The Imagino Line.” Best of all, we are starting to find that our neighbor to the south is finding prosperity and safety which will improve our lives along with theirs.